Even in the womb babies can tell the difference between light and dark. And at birth, they see shapes by following the lines where light and dark meet. Yet, they are several weeks old before they can see their first primary colour – red. In this critical first year, your baby’s brain and eyes begin to co-ordinate images and remember what they’ve seen. As a parent, you can participate in your newborn’s eye development and health as a normal part of your time with your baby. Proper stimulation can increase curiosity, attention span, memory, and nervous system development. So be sure to give your baby plenty of interesting things to see. Newborns can only focus about sixteen to 24cm from their face, and they see only black, white and gray. As early as the first week, your baby begins to respond to movement and begins to focus on your face. Soon your baby will smile when you come close. This is an important sign that your baby sees and recognises you – a joyful moment for any parent. Over the next ten to 12 weeks, you will notice your baby following moving objects and recognising things, especially toys and mobiles with bold, geometric patterns. As their colour vision begins to develop, babies will see red first – they will see the full spectrum of colours by the time they reach three months of age. 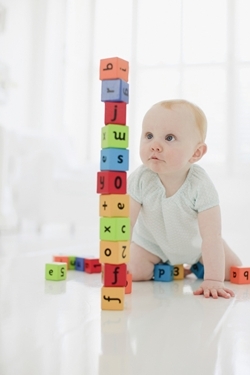 Depth perception and eye-hand coordination begin to develop when babies reach four months. From four to six months, your baby begins to reach out and touch an object – something that previously only happened by chance. By six months, your child’s vision can already be as good as 20/20, which is what we commonly think of as “normal.” You’ll see how eyesight becomes a crucial element in your baby’s ability to coordinate full-body movements such as standing and walking. From eight to 12 months, the connection between eyes, movement, and memory is strong as your baby approaches their first birthday. In the past year you’ve probably noticed tremendous improvements in your baby’s attempts to roll a ball, pick up small toys and objects, and feed themselves foods like cereal or sliced fruit. The best way to help keep your baby's eyes healthy is through regular professional eye examinations. So have your baby's eyes examined – shortly after birth. Are There Benefits for the Eye From Breast Feeding? According to a study published in the February issue of American Journal of Clinical Nutrition, “babies who are breast-fed have significantly better vision as young children than babies fed from formula.” Because scientists have previously hypothesised that the chemical known as docosahexaenoic acid (DHA) – found in higher concentrations in breast milk than in formula – enhances the vision of developing children, the researchers randomly added DHA to the formulas of some of the non-breast-fed children.